Here's an interesting big picture point/counterpoint, gleaned from two parts of Google's world mind. According to Google Trends, as a search term in 2007, Second Life reached a plateau point (much like the world's active user base) and is now slowly declining. 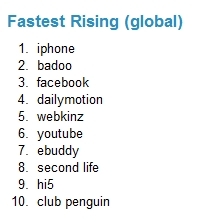 But Google's Zeitgeist metric tells another story: Second Life is one of 2007's fastest rising search terms among non-US Internet users. (Along with two other virtual worlds, Webkinz and Club Penguin.) The pessimistic interpretation is that the rest of the world is trailing a year behind the US, where mainstream interest in Second Life arguably peaked in 2006. A more optimistic view is that international Internet users, as evidenced by countries like Holland, Japan and Brazil, are adopting Second Life more rapidly than their American counterparts. What's your take? It's true that things tend to lag about a year or so for other countries, this is certainly true for 'developing countries'. While it is not clear if India is a developing country, certain elements of that country make if difficult to put it clearly in some box but it appears that there is a growing interest in Second Life in this country. This seems to match their growing use of the Internet (so this may be a confounding variable here). I think we will see a lot of growth from countries with businesses that depend on collaborations in virtual spaces because there are no other options, and if they already have an outsourcing culture, this opportunity might become more apparent to them. We will see a lot more of content developers from these countries before they actually start using the platform for businesses. The US effort seems to plateau but this is only temporary, I think. In fact, I certainly believe that kids growing on Penguin and Webkinz will demand something as plastic as Second Life when they grow up. 10% of the Second Life population will always be content creators, Webkinz and others have close to 0%. This can be a good thing but let's face it,kids have a narrow range of interests. I will be very very very suprised if plasticity does not win simply because if plasticity is well supported and stable, things like webkinz will just be a microcosm coexisting with others within Second Life. In any case, is it not interesting that none of the other MMOs or at least virtuals worlds comparable to Second Life are making their usage statistics openly available? Lastly, the good news is that.... 'naive' as opposed to 'abstract' 3d virtual worlds with avatars is here to stay. Avatar based interactions are no longer something alien....wacky. There seems to be a global expansion regarding our understanding of who we are..what we can do at a distance, and most people involved in avatar based interactions have better opportunities to look more deeply within and hence develop a 'truer' understanding of consciousness and reality. Happy New Year! All my nephews are into webkinz, as a matter of fact it really is truly amazing how many people I know personally that are involved in this online community. Just shows how really large this craze is becoming.